Probably not because I don’t think the person that drew it ever actually saw the comic. Here’s the deal: I made a comic that illustrated what Wikipedia means to me (link to hi-res version). A nice person called DPDarkPrimus posted a link to it on a scifi forum. 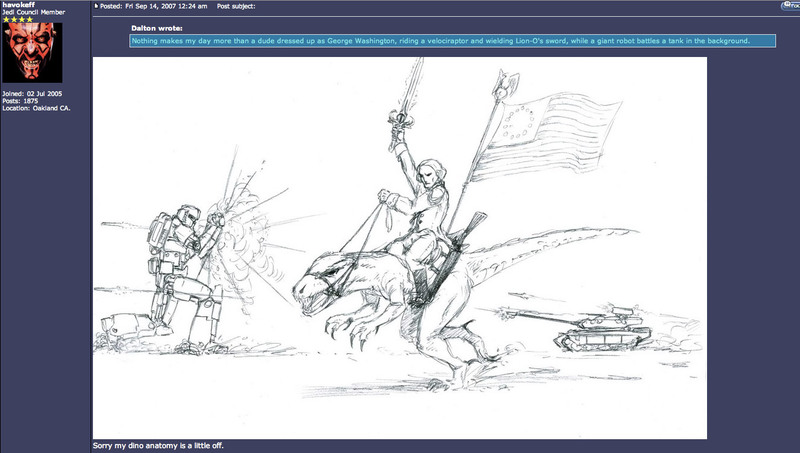 Nothing makes my day more than a dude dressed up as George Washington, riding a velociraptor and wielding Lion-O’s sword, while a giant robot battles a tank in the background. That is the greatest thing I have ever seen. It puts my original to shame. If you know havokeff, please extend my heartfelt thanks for making my day. 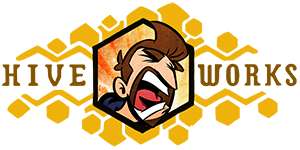 Posted in Comic Blog and tagged dinosaurs, fan art, Internet, wikipedia. I think it may actually be the person that posted it. Yeah I was pretty sure it was the dude that posted it. I found his Deviant Art and linked him to give him credit for the drawing. I hate posting other people’s stuff without them knowing but this was too great to pass up. I nearly wept at the site of havokeff’s depiction of our founding father holding the Sword of Omens atop a velociraptor. The entire Thundercats storyline makes more sense now. I want this guy to come be my friend. That drawing was so freaking awesome. But youre lying, the Thundercats story makes no sense at all. Their planet was destroyed, they travelled millions of light years in stasis then BAM! their old planet reforms in orbit around 3rd earth. No explanation. 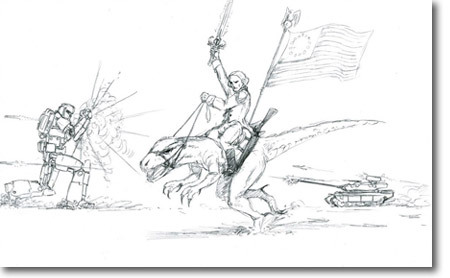 George Washington rides atop a velociraptor and you still can’t make sense of the Thundercats story? I guess you just need to think about it harder, man.